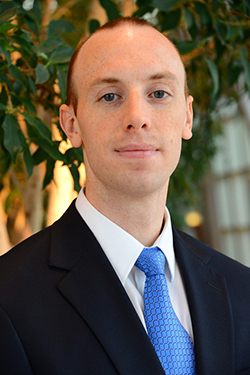 A first-year M.B.A. candidate at the Whitman School of Management, Timothy O’Connell recently secured a position in the Bloomberg Hall of Fame by being one of the top five scorers in the country on the Bloomberg Aptitude Test. As a long distance runner, O’Connell’s resolute nature was integral in being placed in the 99th percentile, the highest in SU history. How did you come to take the Bloomberg Aptitude Test? Michael LaMarche from the Career Center recommended the test to differentiate me and build my profile. There were no cons to taking the test, only pros. It didn’t cost any money, and if I fared well, I could become a part of the database of top scorers that recruiters would use when looking for potential candidates. I’ve already had a couple of internship postings directed to me. What led you to to Whitman’s M.B.A. program? Before I joined the M.B.A. program, I received my accounting degree from SUNY Geneseo. Various internship experiences during my undergraduate career led me towards a career in finance. After dabbling in financial advising at Merrill Lynch, I learned that I enjoyed providing solutions to a client. I then completed an internship at OppenheimerFunds in Rochester, where I worked with both portfolio managers as well as credit analysts. One of the most important reasons I chose Whitman over other programs was that I felt it would provide me with a more individualized experience. When I visited, I felt comforted knowing that I would be a unique student, as opposed to just a number, or part of the crowd, which tends to happen at some of the other larger programs. What are you looking to gain from Whitman’s M.B.A. program? Building a network and gaining credibility in my field of interest are some of the things I’m looking for. I also want to broaden my business knowledge by gaining experience in other aspects of business, such as entrepreneurship and real estate. Whitman has provided me with a greater opportunity to take finance classes that teach the rigorous process of applying theory in real life situations, also known as experiential learning. What strategies would you advise for those planning to take the Bloomberg Aptitude Test? I would recommend taking the time to review all sections at least once. I would also advise them to wait until they have a solid knowledge of finance overall, possibly until the second year, by when they would have covered the core finance courses. The test is a combination of general math and aptitude, but also focuses heavily on finance and so, having a strong foundation is extremely important. Story by Byron Dela Rosa ’16, Whitman School of Management work-study.